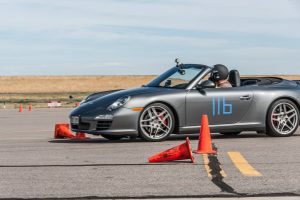 An autocross(AX) is a competition in which drivers navigate their cars through a course defined by orange cones, usually in a large parking lot. Top speeds are generally moderate, topping out around 40-65 MPH (no higher than second gear for many cars). Competing cars are spaced at long intervals — typically only two or three cars are on the course at the same time. Autocross is a safe way to experience high-performance driving while learning to drive your car at its limit. Together, RMR and AMR host several autocross events each year, including Eiskhana (essentially an autocross on the ice!) in the winter and an AX school in the spring. Additionally, autocross is a major event at Porsche Parade. Video of an autocross run.